In the DLI classroom, 50% of the students are English speaking and 50% are Spanish speaking. Students work together to learn to speak, read, write and understand one another’s language. Language arts, math, science and social studies are taught primarily in Spanish for all students in grades K - 1 with 80% of instruction in Spanish. There is a gradual increase in English instruction in 2nd and 3rd grades until a 50:50 balance of English and Spanish instruction is reached in 4th grade and continues through 6th grade. Students must stay with the program through 6th grade to fully benefit and meet program goals. Spanish speakers build a strong base in Spanish and are more successful as they learn English. English speakers have maximum exposure to Spanish in the primary grades when the brain is most receptive to learning a new language. DLI program teachers are specially credentialed and trained to teach in both English and Spanish. 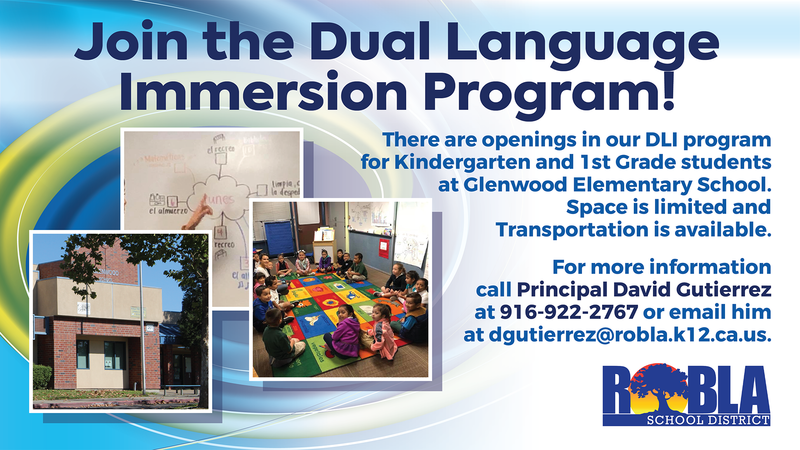 Children in the dual language immersion program have the opportunity to become bilingual and biliterate. They learn to speak, read and write in both English and Spanish. Additionally, they are more culturally sensitive and aware. The earlier a child is introduced to a second language, the greater the chance that the child will become proficient. Bilingual students also perform better than monolingual students on tasks that call for divergent thinking, pattern recognition and problem solving. Who can apply for the DLI Program? All entering kindergarten students are welcome to submit an application. While the program will be at Glenwood School, it will accept students from throughout the district. How will applicants be selected to participate? All applicants will be assessed for language proficiency in English and/or Spanish. This language assessment will help to determine if the DLI Program is a good fit for your child. There are a limited number of spaces available and a balance of English and Spanish speakers must be maintained. If there are more applicants in either language group than spaces available, a random drawing will be held to select participants and establish waiting lists. Priority for spaces in the kindergarten class each year will be given to children enrolled in the DLI classroom at the Robla Preschool, to siblings of students already in the program and to families living within the Glenwood School attendance area.